The body, especially the one of the males can be inscribed in a square. 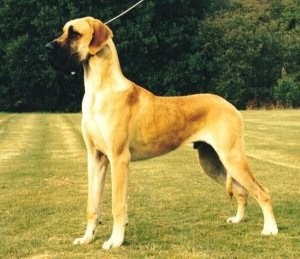 The length of the body (measured from the shoulder to the base of the tale) must not be greater than the dog’s height. The color of the body contains the whole palette from yellow-gold to light yellow, and the black mask is appreciated. Those dogs that have white marks on the body must be avoided, as their race is compromised, and the pedigree is not clean. The base color has all the yellow nuances, having black stripes arranged in the direction of the ribs, and they are also perfectly regulated. The black mask is also great. The base color is pure white, without colored grey spots, but with intense black areas. The spots must be placed random, and they also have different sizes. 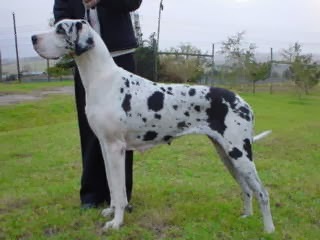 Grey spots or areas means the pedigree is compromised. 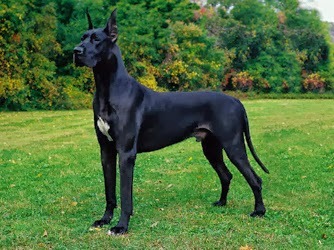 The black Great Dane has a uniform black color, although the white areas are accepted. From this race, we can distinguish the exclusive Dogs with mantle. They are called this way, as the black color covers their entire backside, and the chest is white. However, the Mantle Dog can have a white mantle and a black chest. It has a blue-steel color, but the white marks on the chest are accepted. If you want a Great Dane, you must be certain you can feed and educate him, and you must also ensure the space needed for a huge dog. 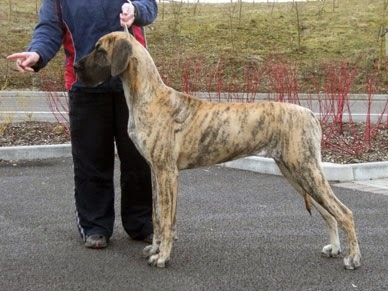 If you decided about a puppy of Great Dane, you will need to prepare some money for its daily care. The Great Dane puppy grows fast, but not as fast as a small one. He reaches its full maturity at the age of three. 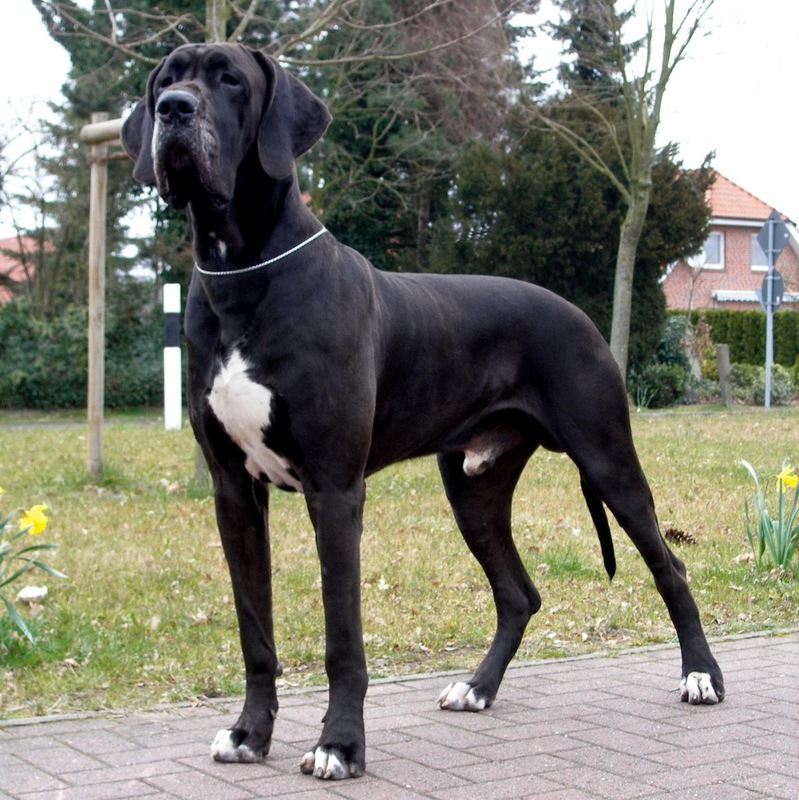 as a puppy, the Great Dane needs quality food, vitamins, and an increased attention from the owner. until the age of two, he will eat 3-4 times a day, and 2 times a day after this age. 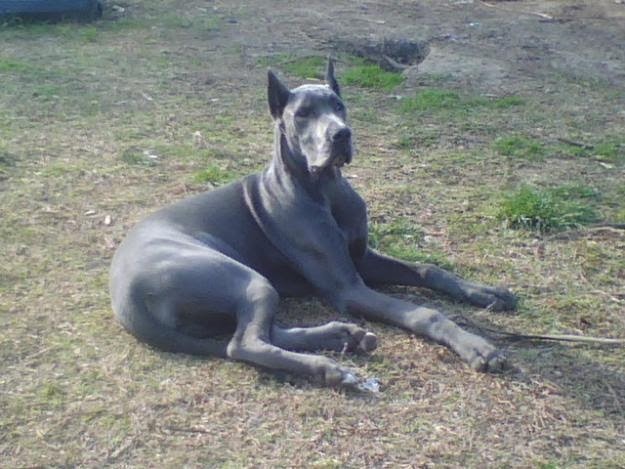 If you are putting the daily portion of food in front of the dog at once, you will risk a huge problem: a gastric distortion-dilatation and this is the main death cause of the adults Great Dane dogs.